Most of us picture “gentrification” as an urban phenomenon. Developers move in on poor or immigrant neighborhoods to take advantage of depressed land values; residents are driven out as rents go up. In rural areas, the same forces are at work, and the stakes are arguably even higher—affecting every plate in the nation. As shopping centers and housing developments expand from the edges of America’s metropolitan areas, farm acreage is lost. As land prices are driven up, no farmer can realistically afford the cost to launch a new operation. Naturally, this rural gentrification is concentrated in our nation’s most desirable locales—places like Puget Sound in the Pacific Northwest, where an estimated 70 percent of landowning farmers will retire in the next decade without a successor, and where suburban and ex-urban development progresses at a rapid pace. One organization is working to protect the farms of the Puget Sound from encroaching development. 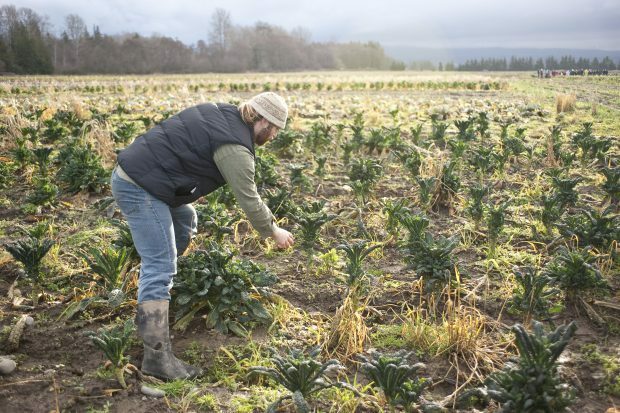 PCC Farmland Trust, a nonprofit formed in 1999, works with existing landowners as well as interested investors to connect farmers with available land. The primary tool the organization deploys is a conservation trust, a legal agreement that permanently protects land from development but that allows certain types of farming to continue. Most trusts are either compensated outright for the lost value of potential development, or landowners may use that loss as a tax shelter. For farmers like Micha and Andrew Ide of Bright Ide Acres, PCC Farmland Trust’s work means all the difference. After working six years on leased land, the couple purchased 30 acres through the trust’s farmland conservation program. “We definitely wouldn’t have been able to even consider land ownership if it wasn’t for the work of PCC Farmland Trust and others helping make our working lands more affordable,” says Micha. Today, the couple supports their family with their farm, which sells meat from ethically raised chickens, turkeys, hogs, and sheep. A Washington farmer tends a field of kale plants. In addition to its primary mission of farmland preservation, PCC Farmland Trust makes education a key priority. Learning opportunities include workshops and training for farmers in sustainable practice, as well as programs designed to engage the community at-large in learning about sustainability and farm conservation. With the growing imperative to source our food from sustainable, regional foodsheds, programs like PCC Farmland Trust have an urgent mission. After all, rural areas close to urban centers are not only key resources in the fight for sustainable food systems, but also prime targets of developers seeking to expand the metropolitan core. These competing interests can, as the work of the PCC demonstrates, co-exist. And in fact, there’s a natural symbiosis between farms and the consumers who rely on them. But without a concerted effort, “market forces” tend to favor over-development.